Tesla increased deliveries more than 100% quarter over quarter in Q3. 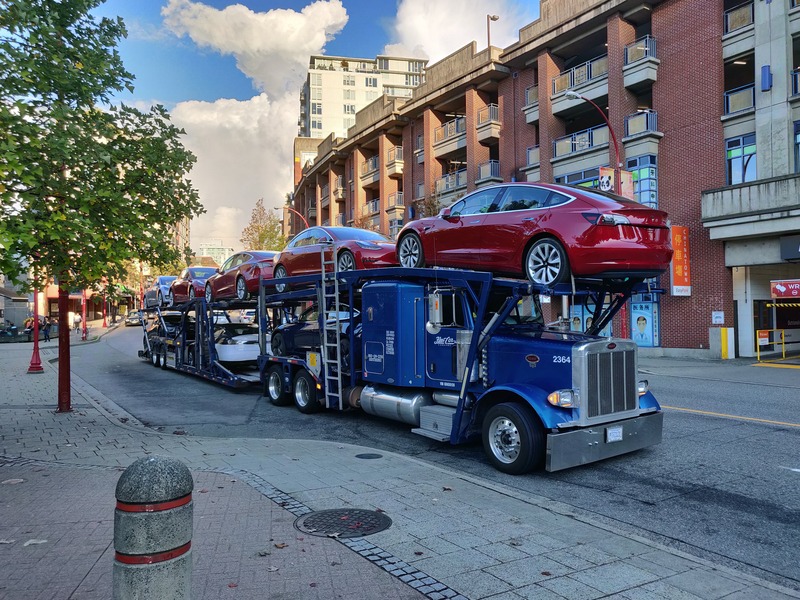 Q3 deliveries totaled 55,840 Model 3, 14,470 Model S, and 13,190 Model X.
Tesla has released its preliminary delivery and production numbers for Q3 2018, with a total of 83,500 vehicles delivered to customers, which amounts to a more than 100% increase versus the next highest quarter in history … which was Q2 2018. The sharp upticks in delivery and the supporting production demonstrate that Tesla has indeed stabilized production of the Tesla Model 3, which accounted for 55,840 of the total deliveries. For the entire first year of its production life, Tesla struggled to build the Model 3, only achieving its initial production target of 5,000 vehicles per week in the very last week of June. Never satisfied with yesterday’s news, Tesla immediately followed up with the announcement that it was adding an all-wheel drive (AWD) and “Performance” build of its Model 3. At the same time, it opened up ordering of the Model 3 to all US and Canadian customers, regardless of whether they had a reservation or not. It essentially blasted open the floodgates for Model 3 orders, but with a huge asterisk. The Model 3 is still only available in a $49,000 base configuration, meaning that there are still hundreds of thousands of customers waiting for the promise of an affordable Tesla at the $35,000 price point, for the Standard Range configuration. What that means for Tesla is that all of the 55,840 Model 3s delivered to customers were higher end, higher profit builds that are critical for the company to achieve profitability this quarter. Musk noted that if Tesla was able to achieve a base production and delivery rate of 5,000 of these higher end Model 3s per week, profitability would be within reach. All signs point to this happening — though, the official financials will be released next month after they have had time to work through all of the nuances of corporate accounting. Tesla also consumed the electric vehicle market in the US in Q3 with its impressive ramp up of the Model 3. According to Tasha Keeney of ARK Invest on CNBC, “Tesla right now, has over 80% market share for EVs in the US. The Model 3 is the top grossing car in the US. So, really, Tesla has reached escape velocity.” That again comes with its own asterisk, as the production and delivery results must be sustainable and we know that while the company may have moved up a few levels in the production hell it was mired in for the better part of a year, delivery hell still has some significant kinks to be worked out before Q3’s results can be deemed sustainable. Elon Musk called all hands on deck over this past weekend to achieve these numbers, even welcoming a love army of volunteers to come assist with the delivery process at its service centers around the world — especially North America — in the mad dash to Q4. A Tesla software engineer shared that the rush to hit Q3 targets pulled in everyone from “Interns, VPs, and everyone in between” to prep Model 3s for delivery in the last few days of the quarter. The delivery process may have its issues, but Tesla shared that it produced 5,300 Model 3s in the last week of the quarter, which highlights that it has indeed found a way to stabilize production of the Model 3 above the magical rate of 5,000 vehicles per week, even with the introduction of the All-Wheel Drive and Performance configurations. The next target is 6,000 per week. The high volume of Model 3 demand is again to blame (if you want to put it that way) for the spike in delivery issues, as Tesla yet again is faced with managing 2, 3, or 4 times the volumes it had ever done in the past. As we recently noted, Tesla went from essentially no mass produced cars to a rate of approximately 300,000–400,000 per year in just 6 years. It’s mind-boggling to think that just a few years ago, we were all obsessed with Model X, and a few years before that, Model S. The two vehicles continue to impress and attract new customers to the ordering portal, as Tesla delivered 27,660 Model S and X, which is “slightly higher than Q2 and in line with our full-year guidance.” Of that, Tesla delivered 14,470 Model S and 13,190 Model X to customers in Q3. Tesla achieved a momentous quarter of production and delivery numbers, but the big question outstanding is clearly around profitability. The high-level metrics look good regarding production and delivery numbers, but cash reigns supreme and that’s where all eyes are going to be focused for the next few weeks as Tesla closes its books. Elon Musk shared in the Q2 earnings call that the company should be able to achieve profitability in Q3 and sustainably from there onward. That’s a tall order for a company that has, to date, been known as a “cash burning machine” (the link lays into that term). Looking to the future, Tesla continues to have opportunities to gobble up new EV market share, create new EV drivers, and bring in more cash. The Model 3 currently is not available as a lease, which Tesla is expected to open up at some point. The $35,000 Standard Range build will bring the car to hundreds of thousands of new reservation holders. And the Model 3 is still only officially available to buyers in the US and Canada, with the whole rest of the world waiting for its turn. Breaking out of North America will open up lucrative new markets for the Model 3 in Europe and beyond. For the Chinese market, Tesla continues to step on the accelerator in order to quickly build its third Gigafactory, in Shanghai, which will allow it to dodge the steep 40% tariffs for goods moved into the country that have eroded Chinese sales over the last few months. 3+ years ahead on battery tech. 3+ years ahead on autonomous hardware. 3+ years ahead on autonomous data — only company collecting data from customer cars.